Dr. Curtis Russell, a biologist with Public Health Ontario, told CBC Radio's Metro Morning that the agency is tracking a "steady increase" in the number of cases of Lyme disease. 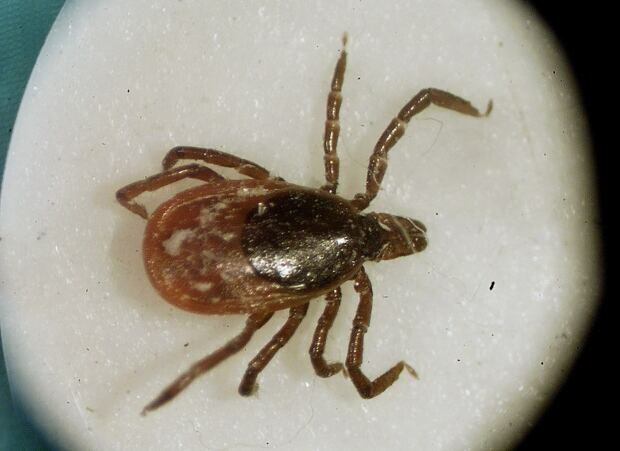 "We're also seeing an increase in the number of blacklegged ticks, which is the only tick that can transmit Lyme disease in Ontario," Russell said on Friday. Ticks are most commonly found in humid, brushy areas, Russell added. In Toronto, researchers have found high populations in a pocket of the Toronto Islands and along the Rouge Valley. "They wouldn't be in, say, a soccer field because the grass is too short and too dry," Russell said. Some ticks carry a bacteria that may cause Lyme disease if you are bitten. Stay on the path: if you're in an area where ticks may be found, stay where it's dry and avoid long grass and bushes. Cover up: wear light colored clothing so you can spot ticks. Long sleeves and long pants. Tuck your shirt into your pants and your pants into your socks to make it harder for ticks to find your skin. Check: after returning home check your body for ticks, paying special attention to your scalp, ankles, armpits, groin, navel and behind your ears and knees. Also check your pets. Wash: take a shower or bath. Put your clothes in the dryer for at least 60 minutes to kill any ticks. Ticks are able to lock into your skin when they bite. If you discover one on your body, use fine-tipped tweezers to carefully remove it without crushing the tick's body. Remove a tick this way. Because deer are the favored carriers of ticks in North America, DeerbustersCanada suggests that homeowners install deer fence in their yards to protect their families from the risk of tick-borne illnesses such as Lyme Disease. By assembling deer fencing, land owners are reducing the risk of Lyme by 97 percent! Search DeerbustersCanada for more information.